Howard, Evan and Ian are inseparable as boys–so much so that one night, abandoned in the forest by the careless adults around them, and raging against society and the uncaring gods others worship, they seal their undying brotherhood with a blood bond. But soon after, a horrific accident scars each of them in a different way, testing their bonds and leaving each with a debt to be paid. As adults, seeking to rise above debt and advance in life, each man decides upon a very different path–but over time, all three discover they are tied to each other in intricately tangled, sometimes violent, and surprising ways that none of them has been wise enough to foresee. 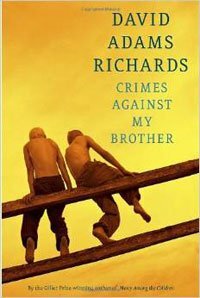 We are looking for book club discussion questions for Crimes against my Brother. Do you have any that you could share?